Here is a list of additional Questions and Answers about the competition. Feel free to add comments or questions. Thanks ! Q1 – It sounds like the pilot’s lounge is for meals. The program says seating for 60, is this tables and chairs for eating? And the kitchen is elsewhere? Do the pilots use this space for anything else (hanging in the evening?) And should this space be isolated in any way, or is it ok for non-pilots to visit and enjoy? A – The Pilots Lounge serves a number of needs. Envision it as a place with couches, coffee tables, barko loungers, and folding chairs. Event goers flying in my stop and rest there, Charter pilots, relax there between flights, briefings are held there in the mornings on the rules of the Airport for pilots who wish multiple take offs and landings, pilots their guests and Airport campers might eat their breakfast or dinner there. Often pilots and campers will donate alcohol and mixers to a temporary open bar that gets set up in one corner of the Lounge. Meals are prepared and served in a separate mobile kitchen which may be attached to the Lounge on one side. Furniture for inside the Lounge will be provided by others. Airport campers will use the Lounge for conversation and socializing in the evening and occasionally someone from town who looses track of time or their way will crash there overnight on one of the couches. Q2 – Is there any reason why the previous design is to be replaced/repurposed ? The current structure that Steve and I put together was never intended to last more then 4-5 years. It was designed on a tight budget ($3000) and constraints. While it could last another season, I wouldn’t trust it to withstand the wind load past that. Primarily the wooded post that are on their last legs. We also used a inexpensive Aluminet top that proved to work just fine given the cost. It doesn’t however provide the deep shade needed and the stress points have given way. So it will need to be replaced. Plus the ease of erection. It goes up pretty quick. But looks like it and we need several bodies to do it. Last is we’ve had the structure for 4 years, It has only seen 8 weeks of exposure. We’re looking at creating something a little more durable with a useful life of twice that. 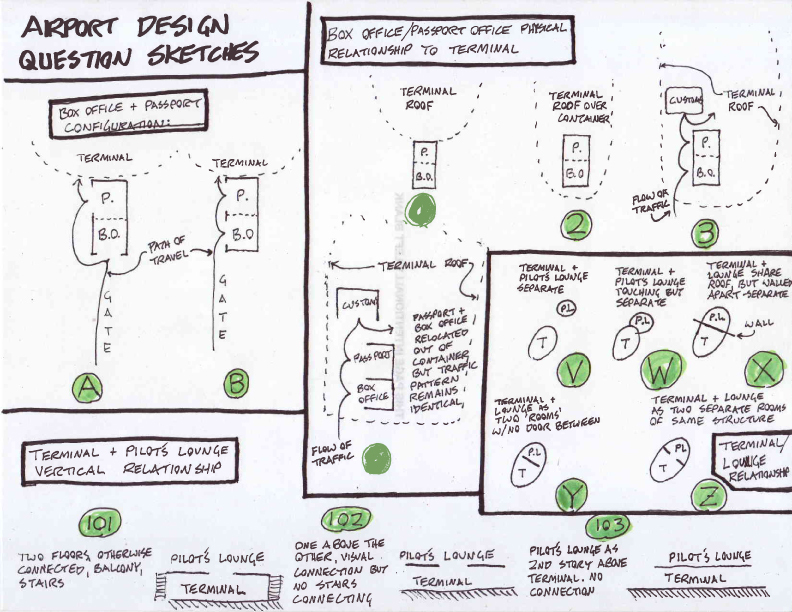 Q3 – Is the container containing the Box Office and Passport Office configured as in sketch A or B? A: B, but at least last year the container was turned 90 degrees so that the incoming traffic faced the windows as they entered from the ramp. The people moved along the container from left to right. (that last point has to do with how they set up the interior flow and is adjustable, according to where the Airport ends up in relation to point 5). OK, so the two offices in the container are interchangeable – ie they can swap sides if needed, year to year? Not swap sides but ends. The windows are on the right as you go in the door on one end. Q4 Sketches 1, 2, 3, and 4 diagram varying degrees of separation between the office shipping container and the Terminal itself. I believe 1-3 are fine based on your prior responses. 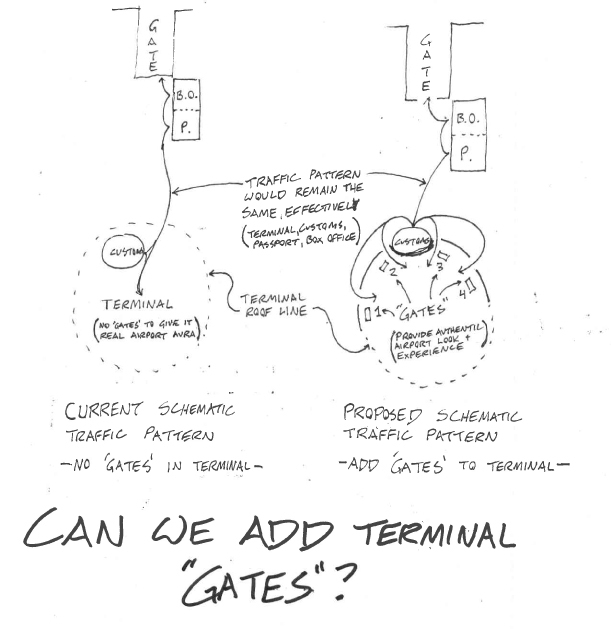 Sketch 3 shows the office container located under the terminal roof, and also locates the customs office to illustrate the controlled flow of traffic between terminal and gate, ensuring that the passengers can’t skip anything accidentally (or otherwise). If sketch 3 is OK, then can I do the exact same arrangement and traffic pattern restrictions, but lose the container? # 3 is the closest to how it works. The container is outside the terminal. Fences force the flow into customs after B and PO. Customs has historically been walled (8’ tall with an entrance and exit), but Customs is misnamed and in reality performs a greeters function. So, channeling flow is important but the need for privacy has grown moot as Burning Man as a culture seems to be moving away from threatening strip searches for the entertainment of the greeters. This would allow for a deeper development of the airport’s architectonics and allow the flexibility to really develop the architecture to inherently improve the function and flow of the terminal. If not, why not? Does the metal container perform some function I am unaware of? (built in shelves and desks, electricity, A/C, etc. etc. all of the previous) OK, but I am still confused why the Box and Passport offices HAVE to be in a storage container. Functionally speaking I suppose they could be little more than a service counter, as long as the traffic flow was unaffected. Because the Org just spent big bucks last year creating the environment and because it deals with $, collecting landing fees and has a safe, etc. 3.Terminal/Pilot’s Lounge Relationship (Sketches V, W, X, Y, and Z) ? Cut to the chase here. “V”, we want to keep both open to the public but create two separate environments. The terminal is for transients. The pilot’s lounge is for those who wish to stay awhile and relax. No qualms about creating two separate environments. The interest in combining them structurally lies in an economy of scale; being easier and more cost effective to build one large structure than two smaller independent ones. If the environments are kept truly and effectively separate with a defined hierarchy, joining them structurally seems it would be a plausible way to go. Yes, but overall Airport camp inside the fence is a small place. Only about 250 people camp there and we want to keep things in scale, as well as not have to deal with sound insulation to keep the two environments separate. V – shows the Terminal and Pilot’s Lounge as two completely separate structures. W – shows the T and PL as separate structures that are immediately adjacent to each other, one built up to the other. Z – Here the Terminal and Lounge are essentially two rooms under one shared roof, with a door or something between them. 4. Terminal and Pilot’s Lounge Vertical Relationship, No, particularly since of all things we have an undefined height limitation. I say undefined because until you proposed it I didn’t think about this. The control tower which is a windowed communication box 8’ x 10’ sits on top of the B.O and P. container, and the controllers need to be able to see over the terminal into the sky to watch air traffic. That is not to say that the terminal can only be 14’ tall but probably should max out at 20’. Also I don’t think that we want to invest our resources in structural support for a second story. Mostly we to focus structural resources so these ‘buildings” can weather the storms. Basically, can the terminal and pilot’s lounge be stacked on top of each other? (I arbitrarily drew the terminal below the lounge, but it could be the other way for the purpose of this question) If so, how much separation is required between the two? Sounds like the ‘NO’ on this comes from a few places: desire for separation of lounge and terminal, height restriction, and material/budget. IF these are ALL addressed, however (ie, <20′, VERY separate, and feasible within budget) AND there was an undeniable BENEFIT to stacking or joining them in some manner, it could be considered. I’m not saying that I even want to do this, BUT, as a designer, I greatly benefit from not just knowing the rules, but understanding them. Hey, you are the creative side here and if after all this back and forth you still want to try and sell any concept have at it with blessings. I am not a judge in this process. In essence the above questions boil down to: WHY not move the offices out of the container? WHY keep the Terminal and Lounge separate. That’s what I’m REALLY asking in the end. Hope by this point I have answered that. Umm… lol… next time’s the charm? I actually have a website called threes-a-charm. Don’t know what to do with it yet. Q “Gate Question” Ok, now I am getting excited. YAY! We have three types of people using the airport, maybe four. 1. We have private pilots landing with their passengers. They need to pay their landing fees, pick up tickets and sometimes if they are staff ID cards, and proceed to customs/greeters. So, those activities I assume are at the box office, what exactly happens at the passport office? Banding of entrants who may become in and out as some pilots and passengers camp in tents under the wings of their planes, and ID for newly arriving staff. 2. We have 6 different charter airlines bringing people in from various cities, and then as the event gets going taking early leavers home. The charter operators have asked for multiple gates and waiting rooms/areas to simplify gathering their people for exit. 4. Private pilots gift rides and their passengers have to be banded as are the pilots so that they have priority entrance and exit privileges. Between Burning Sky and private pilots over 1,000 gifted rides last year. The winner gets a plane ride and a meal and soak for two at Soldiers Meadow Guest Ranch 60 miles away. The Airport is kind of like a Disney land ride but behind the scenes we need to be real serious about how we handle things; rather not slice someone up with a spinning propeller. Considering how busy the airport already is, plus with your expectation of coming growth, I wonder about adding proper airport ‘Gates’ inside the terminal. My assumption is that there is no need for multiple box/passport/customs areas, so at least for now all the gates would lead to the same place after going through them Yes (this could be developed in future years if the need arises, and Yes). However, the experience and perception of the waiting room will be 1000x more “Airport” vibe, with multiple gates, a desk at each one, a place to meet up at, a way to organize the crowds in the waiting room, etc etc.